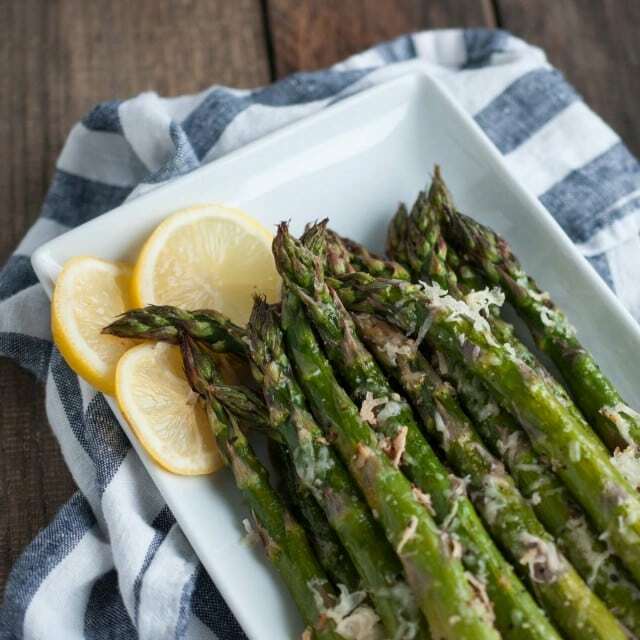 It will take longer for the oven to heat up than to prep this tasty lemon parmesan asparagus! Simple ingredients come together in this classic versatile side dish. Ahh, asparagus, what would I do without you? The simplest veggie to prepare ever. Throw it in the oven with some salt and peppa and you’re good to go. But, for those moments when you want to get a little fancy like, take about two and a half seconds more to top with parmesan and a touch of lemon and all the sudden you’ve got an all star side on your hands. I know asparagus is technically out of season, but spring is right around the corner and its time to be prepared. Before you know it, carrots and root veggies will be a thing of the past and fresh produce will be errywhere. I’m all about the winter veggies, don’t get me wrong. Carrots are my jam. And don’t even get me started on the likes of kale and broccoli! I’m aaaaall about that stuff. Irregardless, summer kinda wins… sorry winter. I first made this parmesan asparagus recipe a couple of weeks ago after a brief trip to Toronto. Now that place knows how to do winter! Holy shiznits. Snow, snow, and more snow. It really put our mild pacific NW winters into perspective. With another snowy trip on the horizon (Whistler! ), I’ve been craving spring and summer goodies more than I usually do. So, enter this parmesan asparagus recipe. Asparagus and lemon because they’re the essence of warm weather eats, and parm, well, because its delicious obviously. These asparagus were plump and juicy, just like I like em. The woody stems at the bottom snapped right off. If you’re working with skinnier stocks, just adjust the cooking time. These fatties needed about 14 minutes total. The amount of time in the oven really depends on how thick the asparagus are and how well done you prefer them. As you can see here, I like them to be nice and roasted, but I don’t let them get too done. Having a bit of a crunch creates texture and adds to the overall dish. Not pictured is the lemon that got squeezed on top to add just enough tanginess to complement the rich parmesan and caramelization on the asparagus. Just know that its there and really helps this parmesan asparagus out in the flavor department. And use fresh lemon! I can’t stress the importance of this enough! Fresh lemon is important in most recipes, but in this one, its absolutely critical. No exceptions here. You don’t need to measure it out. Just squeeze it right on top. About half a lemon is usually about right. If the lemon is super juicy, maybe use less. About a tablespoon is how I prefer it, but some like it less lemony. Its up to you. If you really like lemon on your veggies, this easy spinach recipe is a winner too. Nothing in this recipe requires precise measurements so you can put the measuring spoons away. You can use cooking spray instead of olive oil to make this parmesan asparagus even easier too. We kind of glossed over it before, but check out those crispy parmesan asparagus heads, will ya? You may have heard me rave on about this before… but I love the crispy, carmely bits on roasted veggies oh so much! That’s where the flavor comes from! A lot of people think they don’t like vegetables, but just aren’t eating them in their prime form – which is in most cases roasted. Roasting brings out the best of the best in veggies. As long as you don’t cook the holy hell out of them, most vegetables still retain a decent amount of nutrients when roasted. And for the ones that don’t, just think about how you could be eating a donut, but instead chose a veggie. Considering that, a few killed off nutrients doesn’t even seem like a sacrifice, does it? Its all about perspective. Little wins might not be anything to celebrate on their own, but little wins add up to big wins. Its easy to loose sight of that and think that your diet has to be perfect to be healthy. If you have that inner critic telling you that, shush him or her up right now! Any step in the right direction is a win. Some days call for donuts, others for asparagus. Preheat oven to 425° F (218° C). Rinse asparagus and cut woody ends off. Pat dry. Place asparagus on a baking dish and rub with olive oil. Sprinkle salt and pepper generously evenly over asparagus to taste, along with garlic powder. Rub into the asparagus. Top with freshly grated parmesan cheese. Place asparagus in oven and bake for 10 - 14 minutes until roasted but still crisp (baking time will depend on thickness of asparagus). Remove from oven and drizzle lemon juice on top either right away or after placing in serving dish. 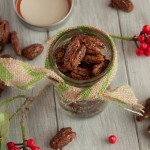 I prefer mine to have a strong lemon flavor so I use about a tablespoon, but you can use less if desired.